Breast cancer awareness month has us thinking about the effects of soy supplementation. In several studies soy supplements to have been shown to have a protective effect against breast cancer whereas other research has shown it can increase breast tumour growth. These conflicting findings have us wondering is soy a friend or foe when it comes to breast cancer? A new study published in the Journal of Cancer Institute followed 140 women diagnosed with invasive breast cancer. These patients were randomly assigned to receive either high dose soy supplements or placebo for 2-3 weeks prior to surgery. The dose of isolated soy protein was roughly equivalent to about four 16 ounce glasses of soy milk or four large portions of tofu daily. Researchers found some women taking soy supplements had elevated levels of genistein (a soy metabolite) which also corresponded to an increase in expression of genes associated with tumour growth. Nevertheless, limited exposure to high doses of isolated soy did not result in a significant change to tumour size versus the placebo group. The investigators concluded that soy affects tumour growth genes in a subset of women with invasive breast cancer. These women could be at risk of accelerated tumour growth with continued high dose soy beyond the few weeks studied in this trial. We know from the aforementioned study that soy supplements can affect tumour growth genes. What is unclear presently is if long term intake of isolated soy protein would enhance tumour growth in women with invasive breast cancer. This study only lasted a few weeks and had a small number of participants. A longer trial could cause potential harm by delaying treatment or enhancing tumour growth. Based on evidence from this and other studies we do not recommend taking soy supplements for breast cancer as it could enhance tumour growth. Furthermore, it is likely that some women respond differently to soy supplementation which would explain the discrepancy in findings across research studies. Dietary intake of soy from whole food sources is not the same as supplementation with isolated soy protein. 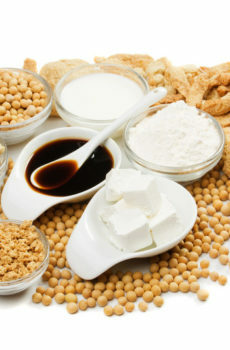 Consuming foods containing soy in moderation is unlikely to cause harm and has many known health benefits. We recommend that women who have breast cancer or are at high risk of developing breast cancer consult with their health provider regarding their soy intake.